So you want to buy a laptop but don't know where to start. You're not alone. Buying a new laptop can present many challenges, especially if you're unfamiliar with laptops or notebook computers. Over the last little while so much new laptop technology has hit the market... Intel Duo Processors, SLI, Dual Graphics... it can all be totally mind boggling to the average consumer. For the first time laptop buyer understanding all the techno jargon can be downright scary. Mainly because a whole new generation of notebook technology comes around every two years or less; probably much less when you consider all the new advances made recently. It can even be a little overwhelming even for someone like myself who runs an online Laptop Guide and who has a keen interest in all things laptop. Regardless of all these fancy new improvements, devices and notebook technology, you must remember you're buying a new laptop for you and you alone. You must first decide if all this new stuff is important to you? Do you really need all this new notebook technology? But most of all before you can consider that question you must first figure out WHY you want a laptop? Why are you buying a laptop? What chores or tasks do you want the laptop to perform? If you just want a laptop for simple web browsing and emailing, a laptop made five years ago will do the job nicely and cost you a heck of lot less. You really don't need a top of the line laptop unless of course, you're keeping up with the Jones and want the latest top model of everything. But that's moving into Dr. Phil's territory... lets not venture there! Do you need a lightweight portable laptop for business trips or meetings? Do you need a student notebook for classes? Or do just want a desktop replacement computer that you can easily move around in your home? Your answer will greatly determine which type of laptop you should buy. In my case, I work full time at home and do a lot of web design so I needed a solid machine with a lot of RAM. I also enjoy downloading and enjoying the occasional movie so a DVD Multi Drive and a wide screen display were important. High quality graphics and sound was also important for what I needed. RAM is to computer what location is to real estate. RAM or Random Access Memory is perhaps the most important factor to consider when buying your laptop or any computer. RAM will greatly determine the speed of your laptop or computer. How fast it will process your tasks and graphics. You must make sure you have enough for your needs. You can now find many laptops pre-loaded with 1 Gig of RAM and capable of upgrading to 4 Gigs or more. Compared to yesterday's computers that's a lot of RAM. If you're not into gaming, handling large video files/editing, all that RAM is not needed but it will make your laptop run faster. Also, remember if you're into gaming, Video RAM will be important -- you need a top of the line (read expensive) Graphics Card and it will increase the cost of your laptop. Also it may be wise to buy a laptop with upgradable memory - since new applications, multi windowed browsers, streaming video... of the very near future may place high demand on your laptop's RAM. CPU or Computer Processing Unit is the heart of your laptop and in this case you have Two Hearts -- Intel Centrino Duo is the front runner in this area right now. However, AMD is giving Intel some stiff competition in the dual core battle with its Athlon≥ 64 X2 dual core processor. Either one would be a wise choice. 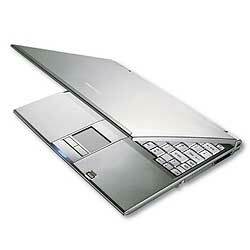 The amount of space or size of laptop hard drives are steadily increasing, a 100 Gig laptop is now common. If you don't want a lot of storage, buying a smaller size hard drive will save you money. Many laptop experts choose the SATA hard drive with a high 5400 or 7200 RPM. Perhaps the major reason you're considering buying a laptop is its size or weight -- otherwise you're better of saving your money and buying a desktop computer instead. A laptop is portable, you can carry it anywhere... tuck it under your arm and cart it to class or your next business meeting. It is ideal for taking your information and work to wherever you want to go. This portability is the main selling feature of a laptop. Tablet PC (smallest) Size of a paper tablet or notepad, less than 3 pounds. Ultra Portable (small) <11" x <10" Less than 1.3 inches thick, less than 4 pounds. Thin and Light (mid-size) 11-14" x <11" 1 to 1.4 inches thick, from 5 to 7 pounds. Laptop prices are steadily falling, it is now possible to get a quality laptop for well under a $1000. Many are selling at the $500 - $600 range. High quality gaming laptops offered by such specialty laptop makers as Alienware, Rock, will still set you back 3 to 4 grand. Ouch! Don't overlook this factor, if you're buying an expensive laptop, you might want to check out these extended warranties. If you do a lot of traveling, you might need to purchase insurance against thief and loss. Dead Pixels Was the Only Thing I Feared! If you can check your laptop for any dead pixels. A dead pixel will give you white spots(pixels)on your LCD display screen. Most cases you're buying your laptop straight out of the box, booting up and finding you have dead pixels is not a pleasant experience. If you want to check your laptop screen for dead pixels, just do a search for the free 'Dead Pixel Buddy' software program and run it to check your laptop for dead pixels. I run a simple Laptop Guide on one of my sites and I also keep a laptop blog so I am constantly using the Internet to gather information and compare prices. You must shop around and check out the consumer reports on the different laptop makers and the different laptop products. You must also check out the service records/reputation of the major brand names. I researched all the different laptops and found the one that met my requirements and price. I bought it in the real world at a local Computer store mainly because I wanted to examine the laptop's graphics and keyboard in the flesh. However, I checked out all of the product's details beforehand on this store's online site -- much easier than in a busy crowded store. Like buying anything, it is always a good idea to fully check out your purchase. Sample the laptop's keyboard, does typing feel comfortable? Try the touchpad, is it responsive? Open your favorite programs and check the processing speed of your laptop. Bring along a DVD and sample the sound and graphics. Take note of any problems or irritations that may pop-up, in my case it was a small right shift key but this was so minor I knew I could get used to it and it didn't stop me from buying my desired laptop. Use the Internet to research your desired laptop, know exactly what components it has and know what software is already preloaded. Be careful of salespeople who will try to charge you extra for configuring or installing programs on your laptop when these programs may already be preloaded at the factory stage! I settled on a Toshiba Satellite P100-SD3: it has Intel Duo, 1 Gig of RAM, 100 Gig Hard Drive, 17" widescreen TrueBrite Display, compatible with the new Windows Vista... it meets all my needs and I am quite pleased with my new laptop. And I will be writing a full review after I have used it for a couple of weeks... but that's another article. If you consider most of the simple points and check out the factors listed above then making your own laptop purchase will not only be quite painless but it may even prove an enjoyable experience. Do a little homework and you will easily find the perfect laptop for you.